’Journey: the act of travelling from one place to another.’ - the other most British dictionary out there, Cambridge. A town nestles in the valley of the North Mountains. If you set sail from Alpenwhist, you’ll reach its nearest dock in a month. From the dock, there’s a 3-4 hour hiking trail depending on your fitness level. Halfway through the trail, you’ll see smoke. It means you’re heading in the right direction. Eventually, you’ll come upon wooden planks, forming rickety steps by the slopping greens to your right, leading to the oak cottages. Welcome to Daysprings! Unfortunately, there are no inns in Daysprings. So if you do swing by, it’s best to know someone in town. Daysprings has a small township. Everybody knows everybody. During the day, you’ll find its people working the farms and gardens. You’ll see little ones playing on the dusty street, and old ones sitting by their porches crocheting. By night, the farmers will hand out unsold, but still fresh, fruits of the day. The children will sing under the ember cottage glow. And you’ll catch a waft of pie, both sweet and savoury in the air. If you head toward the tavern, waves of guffaws will wash past you into the main street, as both men and women end their day with a goblet of mead. The weather in Daysprings is mostly pleasant. Some days, you’ll need mittens, while other days a boater. Generally, it’s a perfect Mid-Autumn’s day. There really is no need to plan a seasonal visit. However, being that it’s rarely open to outsiders, a day trip works best. Thankfully for Thom, he had Seanna. Tip: If you know nobody from Daysprings and you’re backpacking, there are inns by the docks. Prices vary. Check Tripadvisor for reviews. Also, if you’re looking for a guide to hike the North Mountains, you could ask the locals. Some of them will take you up for as low as 10 gold coins. Happy adventures and safe voyage! 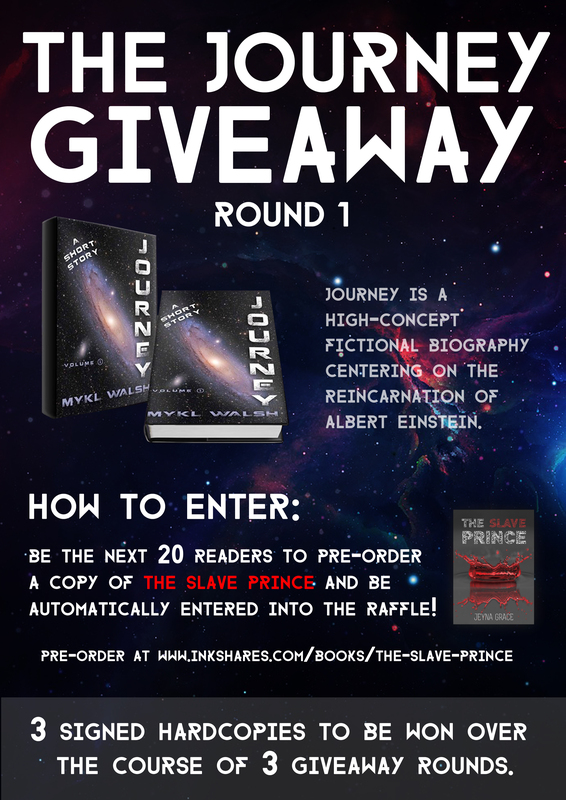 Fellow Inkshares author, Richard Saunders has generously offered 3 signed hardcopies of his novel, Journey, to the readers of The Slave Prince! How awesome is that? How awesome is he? Thank you, Richard! Here’s how the giveaway will work: since there are 3 copies, there will be 3 rounds. The first round is open to the next 20 people who pre-orders The Slave Prince. Be one of those 20, and you’re automatically entered into the raffle to win Journey! The winner will be announced once Round 1 closes, and he/she will be contacted for shipping details. Upon the announcement itself, Round 2 will commence! Yes, I know this isn’t like an all-expense-paid trip to Daysprings. But it’s still a... journey. And this is almost like a Buy 1 Free 1 deal! Almost. So stop contemplating and make your pre-order of The Slave Prince today!